Nelja Energia is the biggest wind power producer in the Baltic States who started its offshore wind power development in 2006 by establishing a special project related company - OÜ Hiiumaa Offshore Tuulepark. In 2006 Nelja Energia submitted the required permit of special use of water to the Ministry of Environment, after which the Environmental Impact Assessment (EIA) process was initiated by the Ministry. Until the EIA report approval, the permit for special use of water is on hold. Planned wind farm capacity is between 700 to 1100 MW, with a distance of 12 km from the coastline of Hiiumaa island. Depending on the turbine type more or less 100-160 wind turbines will be installed. The exact placement of the turbines depends on the National Maritime Spatial Plan (approved in June, 2016) and Environmental Impact Assessment (EIA). 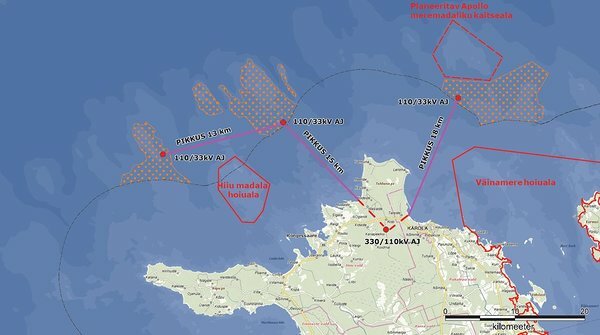 The wind farm is planned to be connected with the Estonian transmission grid through the Kanapeeksi substation in Hiiumaa island.